Florida. Napa Valley. Newport. Belize. Hawaii. Bahamas. These are just some of the places that are considered to be premiere spots for a destination wedding. They’re beautiful. They’re romantic. And, if you plan in enough time, they are also a lot more affordable than you might’ve ever thought. If you and yours are in the beginning stages of brainstorming how you want your wedding day to be, we’ve got a few solid reasons why having a destination wedding may be one of the best decisions you’ve made in your entire life. Even if you did decide to invite 400 people to your destination wedding, due to scheduling and expenses (because guests are supposed to pay for their own travel and lodging), it’s highly-unlikely even half would attend. The less guests who come, the less planning is required for your wedding. Not to say that you don’t want everyone to celebrate your nuptials, but there’s a way to handle that too. After your honeymoon (or even several months down the road), host a reception or a big party. It gives you time to save more money and plan the perfect reception too! While it does depend on what kind of destination wedding you decide to have, in many cases you will pay a mere fraction of the cost if you decide to go with this option; especially if you opt for an all-inclusive package. For instance, while the average price tag on a wedding is between $20,000-40,000, did you know that many all-inclusive Caribbean wedding packages is under $2,000? Whew! Talk about a real money saver! Some couples end up getting married later than they really want to because they prefer to do it during the time of year when the weather is sunny and warm. If you decide to go with a destination wedding, you don’t have to wait for (America’s) spring or summer seasons. Say that you want to get married in December, but you also want to avoid the wind, snow and sleet. If that’s the case, how about going to South Africa? While it’s freezing here in the States, it’s the middle of summer there! People are never at a lack of opinions during the wedding planning process. But if you’re going to have a destination wedding, there isn’t too much that need to be said. All everyone needs to do is get a plane ticket, book a hotel reservation and show up. Plus, if your family and your spouse-to-be’s both want the wedding to take place in your hometowns, getting married elsewhere keeps that debate from being an issue. 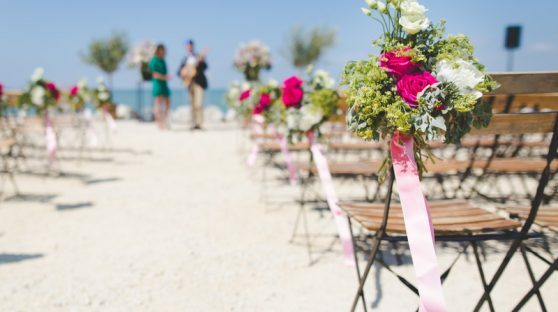 According to reports, 25 percent of all weddings that take place are destination weddings and 99 percent of all married couples take an (on average) eight-day honeymoon. Reports also indicate that couples, on average, spend three times more on their honeymoon than on a “regular” vacation. If money is tight but you still don’t want to deprive yourself of this kind of trip (and you shouldn’t), that’s just one more reason to have a destination wedding. You can get married with your family members and friends and then stay a week longer or more. You can save even more money by renting a vacation house instead of staying at a hotel or resort. We don’t know anyone who had a destination wedding and regretted it. Most actually said it was one of the best things they’ve ever done; that they loved it so much, they returned at least once for their anniversary. And that’s just our point. Beautiful memories can last a lifetime and just imagine how romantic it would be to return to the same place you pledged your love every year…maybe sometimes to even do a vow-renewal. Out of all the reasons we’ve given you to consider a destination wedding, this just might be the best one of all!